Per Afterschool Alliance, out of school STEM programs show positive outcomes in improving students’ attitude towards STEM careers, increasing their knowledge and skills, and providing a higher likelihood for graduation. Bring a breadth of STEM programs to enrich your students’ learning before and after the school hours including Early Release Days. We work with mixed grade groups – convenience for you and parents as children can stay at school for these enrichment programs. We come to you. So, there is no cost to transport and it is easy for parents to pick-up. We bring hands-on STEM to your students during the school day. These are grade level focused STEM workshops designed to extend students’ learning of science and math. Per school Alliance, school STEM programs show positive outcomes in improving students’ attitude towards STEM careers, increasing their knowledge and skills, and providing a higher likelihood for graduation. 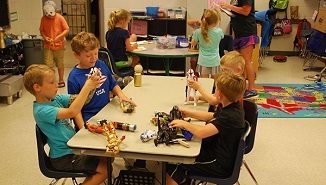 Bring a breadth of STEM programs to enrich your students’ learning at the school hours. We work with mixed grade groups or per grade – according to school requirement. We come to school so there is no cost to transport and it is easy for parents. Each student designs a project and then builds it over a period of 8 weeks. We can come to your site and provide custom camps for your students on-site when school is out of session. We can handle everything from student registrations to program delivery and can customize based on your needs. Off-site track out and year round camps may also be available in your area. Cost: Camp start from $230 for a two day camp, to $440 for a four day camp. Camp run from 9am to 3.30pm (drop-off from 8.30am and pick up by 4pm). What to bring: Kids need to bring a hat, food (lunch and morning tea). However, all devices and software is provided by us.